The holiday season is finally here, and this year Little Steps patients are invited to celebrate by coming to meet and get pictures taken with Mickey Mouse, Minnie Mouse and the Elf on the Shelf. During the holidays, many families make trips to department stores or shopping malls to see Santa and his elves. However, a crowded store or mall can overwhelm highly sensitive children. This event at Little Steps offers an alternative for kids who’d like to meet some of their favorite characters in a calm environment. Mickey, Minnie and the Elf on the Shelf will be at the Little Steps Glenview location (41 Waukegan Road) on Sunday, December 9 from 10 a.m. to 1 p.m. In previous years, Santa has visited Little Steps. This year, though, the staff decided to mix things up and voted to bring in a different cast of characters. 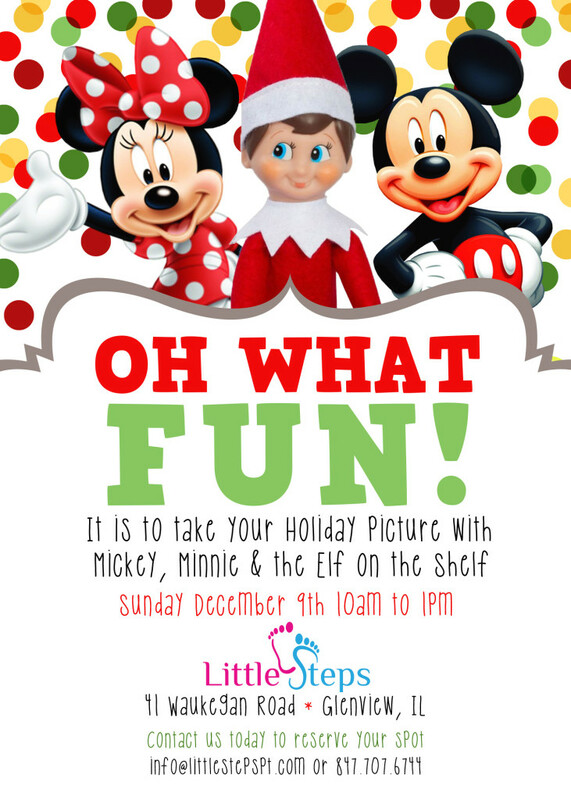 Current and prospective Little Steps patients can reserve their spot to visit Mickey, Minnie and the Elf on the Shelf by calling 847-707-6744 or emailing info@littlestepspt.com. Little Steps is a privately owned company made up of pediatric professionals who provide pediatric physical therapy, speech therapy, occupational therapy, and behavior therapy to children of all ages. We’re dedicated to providing comprehensive and compassionate care to improve the lives of children one step at a time.